Venture into the Micro and Nano structures! Before payment you will always receive an email with attached the photographs and photomicrographs of the products you've ordered: what you see is what you get. 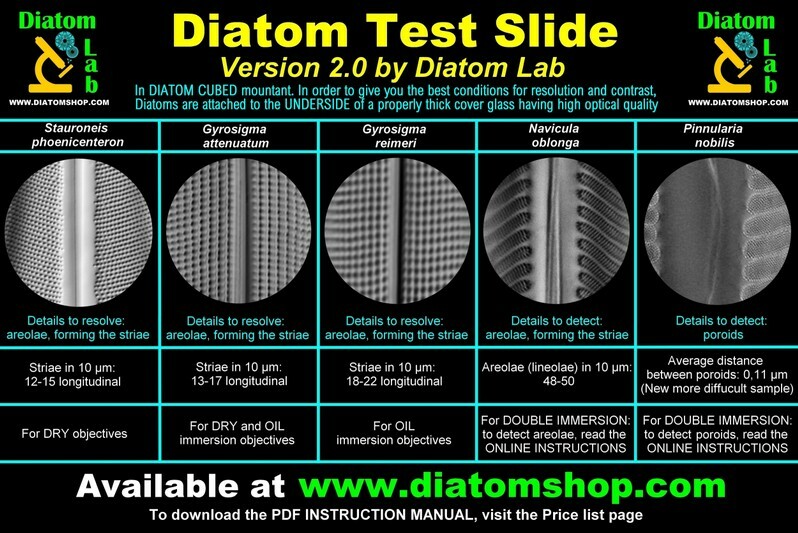 Diatom Lab works with honesty, accuracy and transparency. You'll always receive a paper invoice (if you are a business company) or a paper tax receipt (if you are a private customer) with every purchase. All parcels are fully tracked, so that you can check the progress of your items through to delivery. Diatom Lab safely ships WORLDWIDE using microscope mailer cases, bubble wrap and paddled packages: customers of Diatom Lab live in USA, Europe, Asia, Oceania and Africa! Payments are possible using PayPal (no PayPal account needed, just a credit card!) or bank transfer. 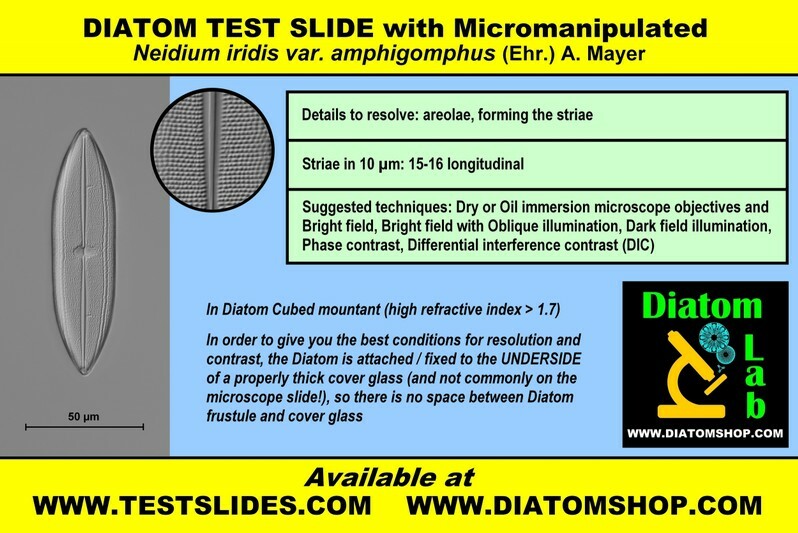 DIATOM TEST SLIDES (Microscope slides): Venture into the Micro and Nano structures! Pinnularia nobilis (for Double immersion = Oil immersion objective and Oil immersion condenser). As always, Diatoms are attached / fixed to the underside of a properly thick cover glass (and not commonly on the microscope slide!) 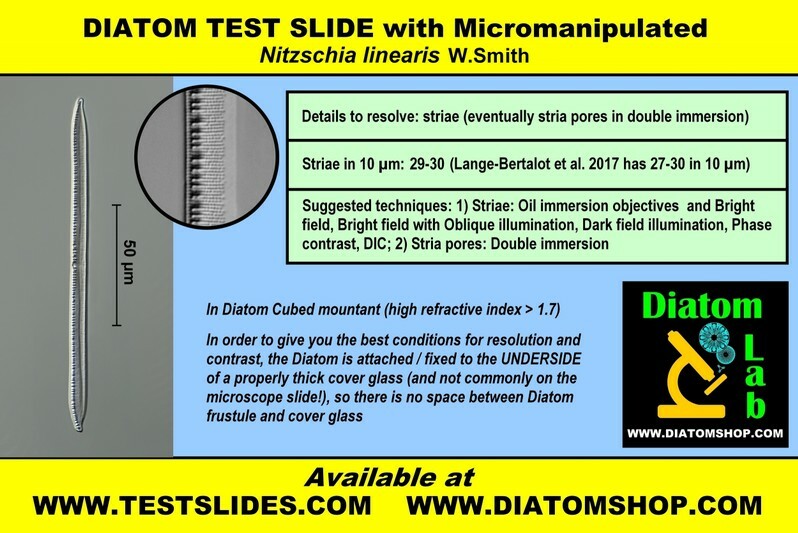 in order to ensure the best conditions for excellent resolution and contrast!The customized cover glass (coverslip) with high optical quality is manufactured in Germany specifically for Diatom Lab. In Diatom Cubed mountant! The theoretical limit of resolution of most light microscopes is ∼ 0.2 μm, but these poroids can be detected by the techniques below, thanks to Diatom Cubed high refractive index mountant! Average distance between poroids: 0,072 - 0,089 µm. See SEM image from the same sample! 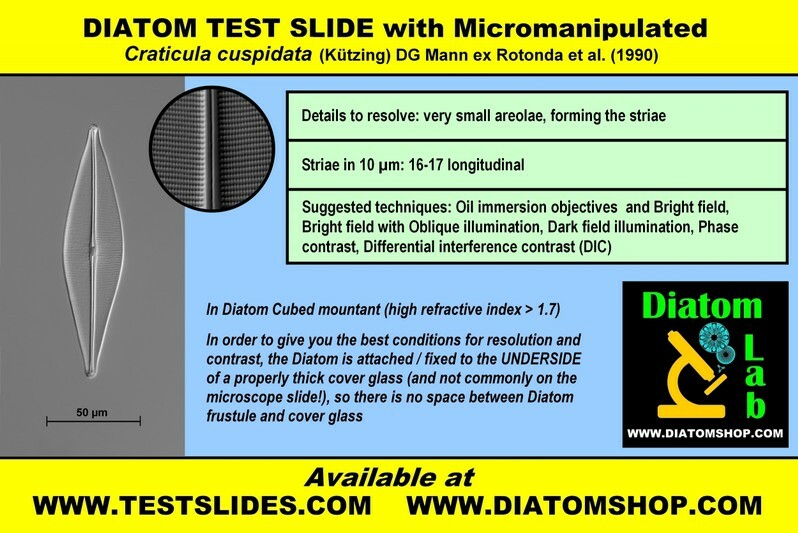 As always, Diatom is attached / fixed to the underside of a properly thick cover glass (and not commonly on the microscope slide!) in order to ensure the best conditions for excellent resolution and contrast! 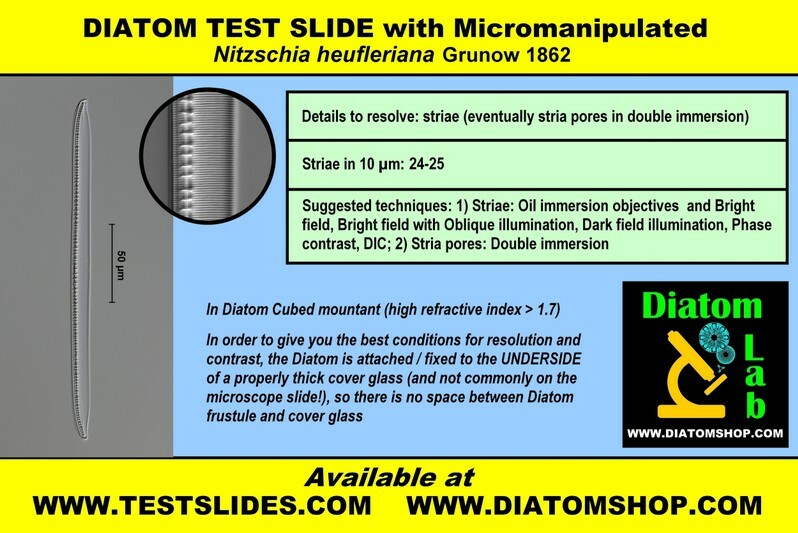 The customized cover glass (coverslip) with high optical quality is manufactured in Germany specifically for Diatom Lab. In Diatom Cubed mountant! Viewed with SEM, the average distance between areolae is 0,14 µm. The theoretical limit of resolution of most light microscopes is ∼ 0.2 μm, but these areolae can be detected by the techniques below, thanks to Diatom Cubed high refractive index mountant! Viewed with SEM, QUANTITATIVE FEATURES in Diatom Lab's sample are: Areolae (lineolae) in 10 µm: 48-50. AVERAGE DISTANCE BETWEEN areolae (lineolae): 0,14 µm. See SEM images from the same sample! As always, Diatom are attached / fixed to the underside of a properly thick cover glass (and not commonly on the microscope slide!) in order to ensure the best conditions for excellent resolution and contrast! 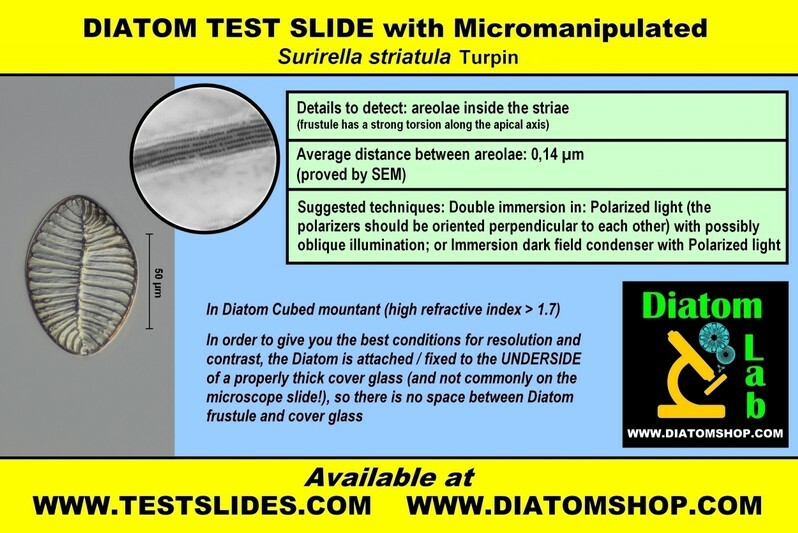 The customized cover glass (coverslip) with high optical quality is manufactured in Germany specifically for Diatom Lab. In Diatom Cubed mountant! AVERAGE DISTANCE BETWEEN POROIDS: 0,11 µm (NEW MORE DIFFICULT SAMPLE! ), see Scanning Electron Microscope (SEM) measurements. 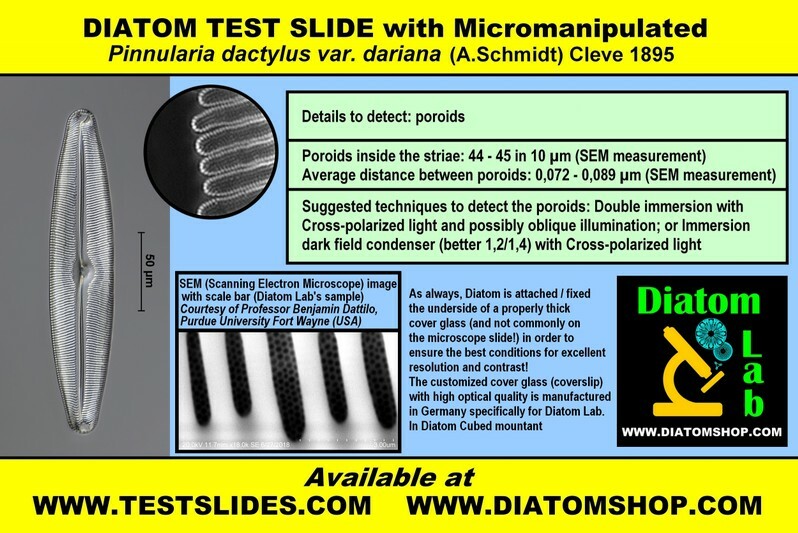 NEW DIATOM TEST SLIDES WILL BE ADDED SOON!